Your cactus can survive just about anything, but you still need to deliver some packages on time. 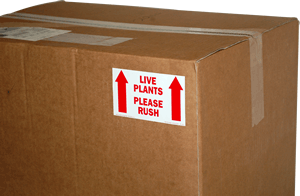 Perishable Shipping Labels are great for food, plants, or anything that's time or temperature sensitive. Alert shippers to quickly process the packages. • For maximum visibility, place your message on all sides of the container. Scuff and scratch-resistant. • Includes an aggressive adhesive that sticks well to boxes, drums, shelves, and more.